All Hail to Hale Roach, Frank Milo and Sandy Berman. 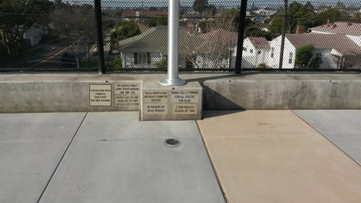 Friday, September 2, 2016 celebrated the opening of the new El Cerrito Memorial Stadium and the dedication of stadium facilities to three men: Hale Roach, Frank Milo and Sandy Berman. Details of the event can be found here. Were you an athlete or member of a spirit group at El Cerrito High? Are you proud of your contributions as a Gaucho? Do you want your performances to be remembered for time immemorial? You know you do! Here's your opportunity to let everyone know your greatness! How? Order a tile with your name, sport(s) or spirit group and years of participation. 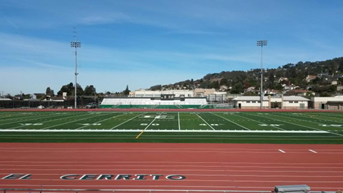 We will install it for all to see in the new El Cerrito High School Memorial Stadium! "We" are the El Cerrito High School Archiving Project, and it is our mission to support the development of a strong ECHS alumni body, to collect, preserve and celebrate the history of El Cerrito High School and develop connections to current students and to the El Cerrito community. Our Tile Project will raise funds exclusively for ECHS student scholarships. Please help support the Archiving Project and ECHS students by purchasing a tile today -- memorializing your contributions in the process! Installation will begin as early as Fall 2016. If you have any news you'd like to share, please email me at andrealum@yahoo.com. Cheering on the Girls' Basketball Team...RBAL champs! then you're a Gaucho, Class of '85!